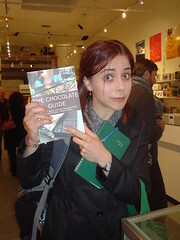 A fan of the Chocolate Guide at the Zinc Details Chocolate Tasting and booksigning receiption on March 20th in San Francisco, featuring the TeaRoom Chocolates and Cosmic Chocolates. The Defamer reports that the Food Network and others are feeling that TV Host Chef Nigella Lawson's bottom half may have gotten a tad too large for television, and her director is putting a lot of work into not showing her "better half." "Between all the too-hairy, too-skinny, too-mental coverage womankind is getting in the media these days, you'd be forgiven for thinking that there are better places to be than in the spotlight. And now it seems even sextastic television chefs - i.e., people who are generally accepted as being able to eat FOOD, as opposed to the sunlight and roasted almonds that the other female stars are served up - aren't immune to the exacting pressure of waistlines and bum sizes. Celebrity chef Emeril Lagasse joins Planet Green and will share his philosophy for fresh, top quality food with viewers this summer in the new original series EMERIL GREEN (wt). Planet Green, Discovery Communications' new 24/7 eco-lifestyle television network, is set to launch in June 2008 with a full slate of original series and specials premiering throughout the summer, including EMERIL GREEN. "EMERIL GREEN (wt) joins two greats in the world of cuisine. With his dynamic and entertaining style, Emeril has inspired millions of people to experience the joy of food and cooking. Whole Foods Market has been a leader in making organic and sustainably produced food a part of our daily lives," said O’Neill. "Together, they are the winning ingredients for an innovative series that will redefine food shows for the new green culture." With an increased focus on organic and locally grown foods, many Americans are often confused –sometimes even intimidated -- about how to cook healthy meals for their families. In EMERIL GREEN (wt), Lagasse shares how the best meals start with high quality produce, seafood and meats, and helps families get inspired by using fresh and seasonal ingredients. Shot on location at Whole Foods Market, Lagasse works with everyday cooks with real culinary challenges, enlisting the help of the knowledgeable team at Whole Foods Market and other experts to hand pick the best ingredients for every recipe, turning ordinary meals into extraordinary experiences. Faced with questions about quality, cost, taste and even some daunting food dares, Lagasse helps viewers conquer their culinary fears with an open mind and a healthy curiosity.